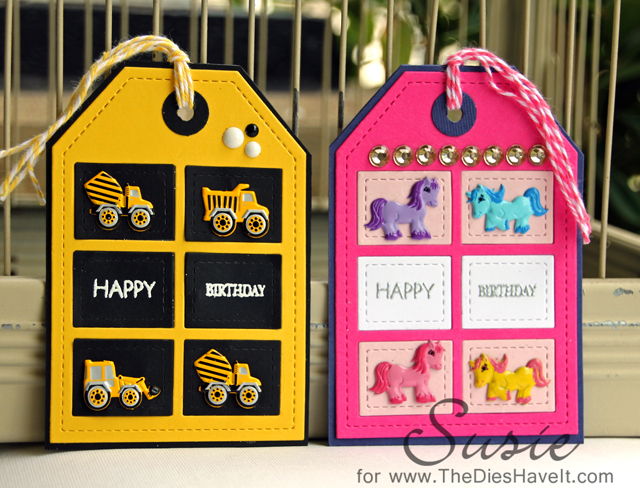 If you have kids, or are a grandma like me, you know you always need birthday gift tags. I made the first one using Eyelet Outlet Truck Brads. I just adore the yellow and black. It was a challenge to find sentiments small enough for my little windows, but I did succeed. I added some Eyelet Outlet Enamel Dots to the top of the tag to tie everything together. these tags away until needed (very soon).